Majid Samii, the world-famous Iranian medical scientist, has been named by World Academy of Neurological Surgery as the world’s top neurosurgeon. 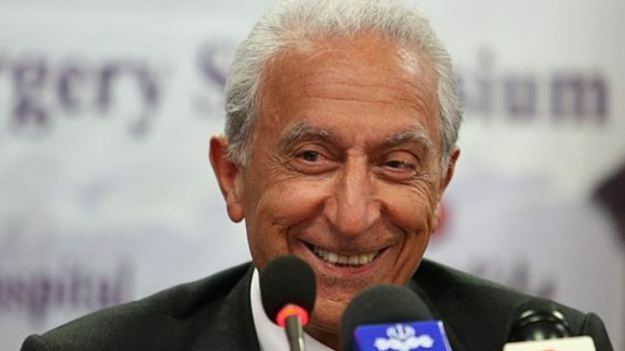 The world-renowned Iranian scientist in neurological surgery Professor Majid Samii has garnered the 2014 Golden Neuron Award. The award was announced during a ceremony held at the biannual meeting of the World Academy of Neurological Surgery in Vienna on October 11. Many leading scientists and neurological surgery scholars have flocked to the biannual meeting that kicked off on October 9 and will run until October 12. Iranian neurosurgeon and medical scientist, Professor Samii, had earlier received the 2014 Leibniz Ring Prize in Berlin. Prof. Samii is renowned worldwide for his life trajectory and especially for his work in the Project Africa 100.